flossyblossy: Let the auction begin!! I was going to show you the pillow i received in The Pillow Talk Swap but instead i went AWOL. Another time though, as it there’s something WAY more important i want to show you first! 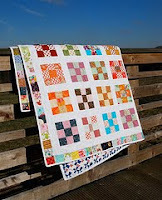 Katy and I had already decided to make a charity quilt around the time the earthquake hit Haiti. Then before we’d got the quilt finished Chile also suffered an earthquake and tsunami. We both have a good friend whose husband is from Chile - with many family members and friends living there - so we wanted to try and do something to help both causes. Given that we have no skills in search and rescue or medicine, a quilt auction seemed like the most obvious choice! There are a million and one wonderful charities that are helping the survivors of both these terrible disasters but the one we’ve decided to donate the proceeds to is Doctors Without Borders. So.... we had a couple of sewing evenings at my house drinking tea, laughing like drains and making 9 patches. We delved down to the darkest depth of our overflowing scraps boxes (and survived!) to make it as lovely and scrappy as possible, and then sashed the blocks with pure white cotton. 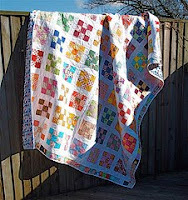 I quilted it with my most favourite-in-the-whole-wide-world method of quilting (swirly loops) and Katy has bound (binded?) it in white cotton to create a tiny white border around the edge. If we do say so ourselves, the result it pretty gorgeous!! The quilt is 64" x 80" (160cms x 200cms in new money!). It is made with 100% cotton fabrics with Hobbs Heirloom 80/20 (cotton/poly) wadding. Please add a comment to this post with your bid (obviously higher than the last) in US dollars*. Also, include your e-mail address so i can contact you should you win. Once the winner has sent confirmation of the donation to Doctors Without Borders then this beauty will be sent to them. Easy? The auction is now over!! !